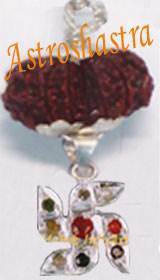 Highly auspicious pendant with Eleven mukhi Rudraksh surrounded by Seven Mukhi Rudraksh and Five mukhi Rudraksh. 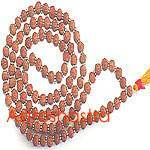 This pendant represent the eleven forms of Lord Shiva and powes of Eleven Rudra Avtaars. 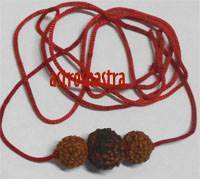 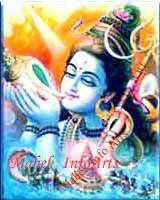 It is beleived that wearer of Rudra Pendant is freed from the sins of Eleven Births. 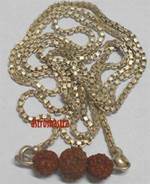 This pendant can be placed in Puja Ghar in Red Cloth for the blessings of Lord Rudra. 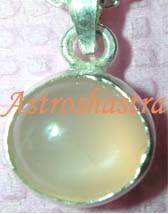 This Pendant is also very beneficial in Stomach ailments and Diabetes. 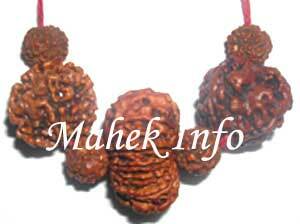 Maa Lakshmi also bless the wearer of Rudra Pendant. 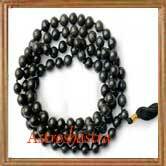 Wearing Mantra : "Aum Hreem Huum Namah"